Since many years, graphic designers, customers ask us questions about where they could learn how to design typefaces without taking a year off at MATD or KABK. This is in order to respond to what’s missing in Europe, particularly in France, that we have decided to work on this project since summer 2014. Following the official launch of the website earlier this month, our team is working to add new sections and features. Today, it’s this blog post! We will do our best to explain more what will happen during the 5 weeks starting on the 15 June 2015. We will also use this section to do regular reports of what the attendees have done, week after week. Since the 17 March 2015, we’ve already received many applications, from many different parts of the world. Different backgrounds too! 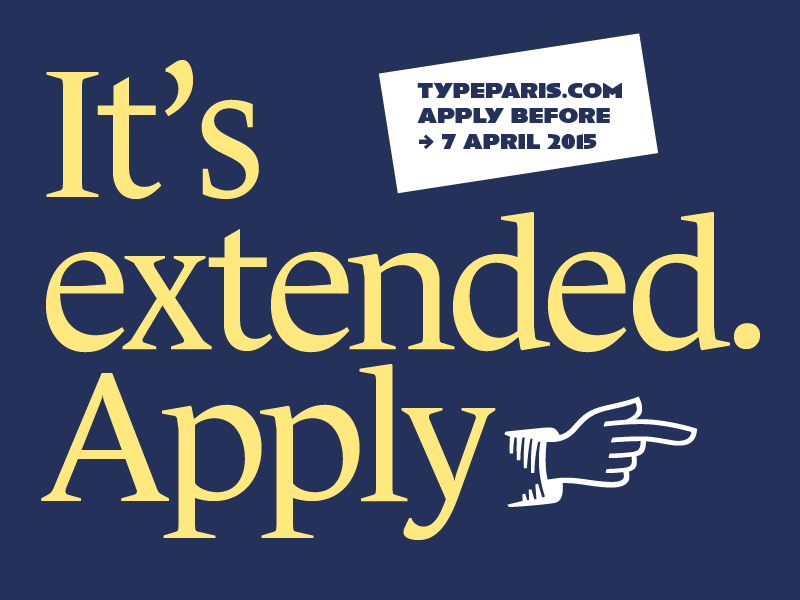 Type@Paris is the first intensive type design program in Paris, offering a unique approach in Europe to learn type design from scratch (or almost) following a long tradition of curriculum started in France in the 70’s. Each week, international guest experts will visit the attendees, to help the core team of instructors. Because of their different background and experience, it will really good. Some can feel that because this numerous guests planned, along visits to fabulous places, full of historical ressources, as Bibliothèque Nationale France, that attendees will listen, visit — but not work on their type design project so much. Not at all! The main in objective is that every attendees have to finish a full typeface on 17 July 2015 including at least a regular, but why not an italic, or a titling version, a bold? We are here to learn together how to design typefaces. Don’t worry you will be at your desk working on your letterforms everyday. Due to numerous requests, we extended the deadline. You can now apply until the 7 April 2015. Just follow the application process as explained on Program page. You should try too! But don’t miss the new deadline, no more extension planned! Experienced graphic designers, typographers, web designers or even design school typography teachers. Freshly graduated design trainees or trainees entering a final year who are passionate and eager to deepen their typography skills and knowledge. Someone who wants to try an immersive typographic program to gain a better a sense of what it takes to produce professional type designs with a high level of quality and adherence to perfection on a daily basis.